HGST is close to launching world's first 10TB HDDs as part of the company's UltraStar HelioSeal lineup. 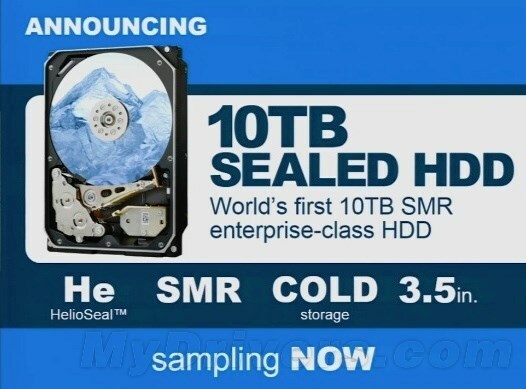 The company, which is a division of Western Digital, started sampling its first 10TB sealed HDDs some time ago, these units are filled with helium and use shingled magnetic recording (SMR) technology to offer even platters with 1.43TB of storage capacity on each of them. We don’t know the full specifications yet, but the 3.5-inch form factor SATA 3 drive will offer 128 MB of cache, a five-year warranty, two million hour meantime between failure (MTBF) rating, and Instant Secure Erase features. These disks should start shipping next month or so but eTeknix writes they won't be the only 10TB HDDs from HGST. The firm is also rumored to be working on a six-platter variant with 1.66TB of storage capacity on each platter. So far helium-filled HDDs are primarily intended for cold storage applications but within a year or two HGST may fill all of its HDDs with helium.